Over the last couple of years, I've had my forever-ongoing Bultakenstein project bike, but that's not something that's been ridable, and probably won't be for years to come. And, I've got my Spyder for commuting and long trips, but that's not the same as being on two wheels. I had been looking for a small, simple neighborhood runabout that I could buy cheap and just give a good once-over. The idea was that with a couple of weekends of work and not a ton of cash, I'd have a fun runner that would keep me on two wheels cheap while I continued concentrating my workshop time on the Bultaco bitsa. 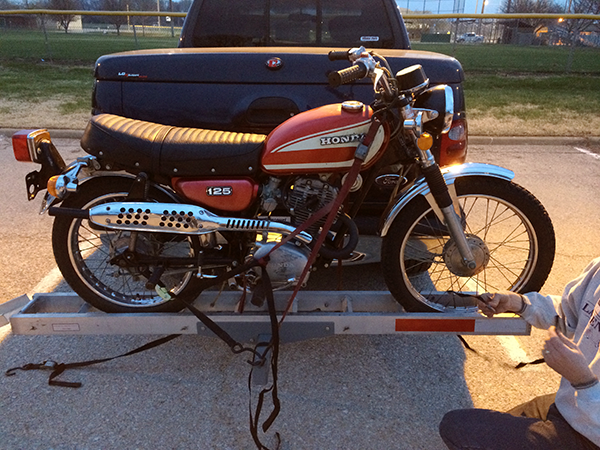 Thus, a tick over a year ago, (early April '14), I picked up a '74 CL125S. Emotion definitely got the better part of me, because this was the spittin' image of my very first motorcycle that I bought in July of 1980. 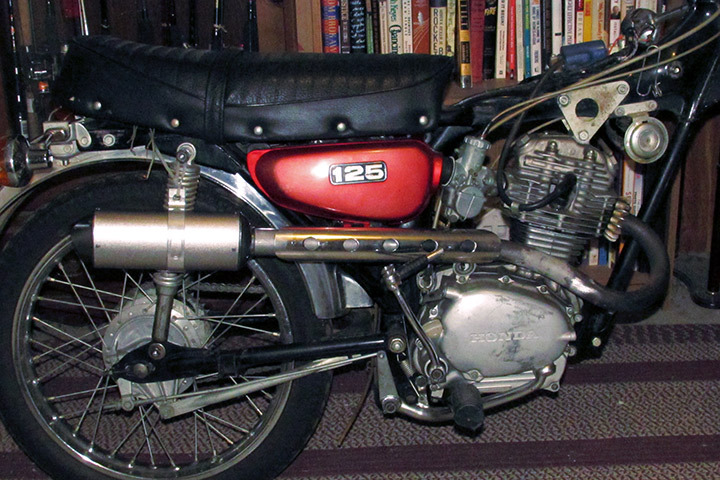 Mine had been a '73 in Hawaiian Blue, but it needed a new fuel tank and it soon ended up with the same red '74 tank as on this bike. (I spray-painted the blue sidecovers black). The CL was only made 2 years and they don't come up for sale around here very often. It's almost identical to the more run-of-the-mill CB125, but I've always loved the cool exhaust and the other little touches such as the crossbar on the handlebars. The seller wanted $900. I offered him seven. He took my money and couldn't run away fast enough. Well, I bought it from a student at the University of Kansas, about 45 minutes away on other side of the state line. It started and ran, to a point, but it had lived a hard life and was in sad shape. It had obviously been down multiple times, on both sides. There were some pretty dodgy repairs (college student style). A lot of miles have been put on it; it's impossible to say exactly how many, since the speedo/odo was inop. The big issue was an obviously holed muffler. No matter; it could all be patched up well enough to capture all the sights and sensations of my first bike from so long ago. Unfortunately, there was no valid title on the bike, which complicated things (not only because I was out of state, but my home state of Missouri is downright nazi-like about motorcycle titles — somewhat understandable due to an overwhelming bike theft/chop problem over in St. Louis). It took over five months and a couple of hundred bucks to get a valid title. Like I said, emotion got the better part of me, because once I got the bike home, it became apparent that I'd underestimated the amount of refurbishment the bike would need. I'd bought this specifically because of the cool exhaust on it, and the muffler was rotted from one end to the other. 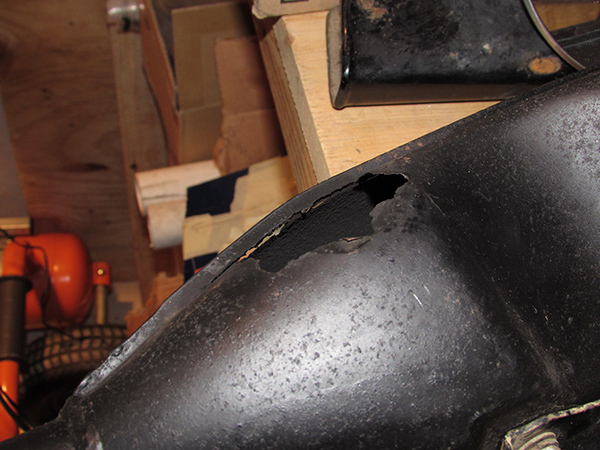 Nothing but the headpipe was salvageable. Worse, once I cleaned the thick, caked-on layer of sludge and fuel varnish off the bottom of the tank, I found pinholes all along the bottom on both sides. >Sigh!< This was turning out to be a very, very stupid purchase — and the second project bike I told myself to never take on. Needless to say, a bit of Ebay and forum searching revealed my worst fear: serviceable exhausts are nearly nonexistent nowadays, and those that are left are valued accordingly. So much for recapturing the look and feel of a stock bike. I would have to improvise. I bought a $40 generic oval can muffler from Hong Kong and a length of 1/8" thick x 1-1/2" OD steel pipe from my local metal shop. I hacked off the muffler and using my lathe, I bored out one end of the pipe to slip tightly over the end of the stock headpipe. 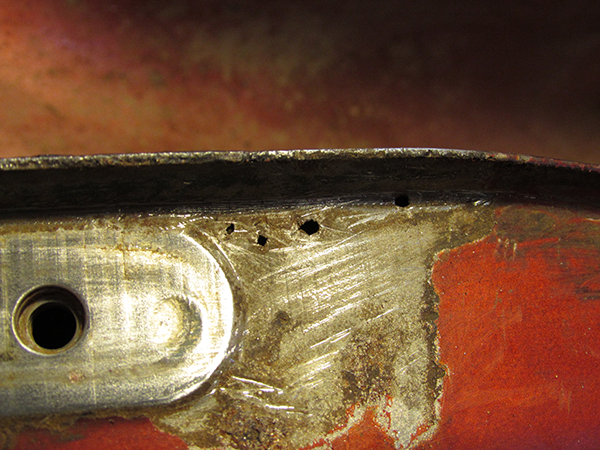 Just a bit of burnishing with emery paper allowed the other end to slip inside the universal muffler. I drilled and tapped three holes for setscrews at 120-degree intervals in both the pipe and the muffler to hold the whole thing together. There was no way to adapt the original chrome heat shield, so I fashioned one from a length of larger-diameter stainless pipe, which also neatly hides the joint between the stock headpipe and the steel pipe. I still need to make a couple of hanger brackets. I used some high-heat JB Weld to smooth out a particularly rust-pitted section of the headpipe, and I'll hit it and the extension pipe with some hi-temp flat black exhaust paint once it's running again. There's a lot more to do. So far, I've knocked the dents out of the fuel tank, stripped it, and soldered up the rust holes. I have some Caswell tank liner on my workbench, ready to coat the interior. After that, the plan is to replace the old dry-rotted tires, remount the headlight properly, mount a $40 digital speedometer from Ebay, and replace the brake shoes and turn signals. The shifter shaft seal also needs to be replaced. Hopefully THEN I can FINALLY get this thing past MO safety inspection, start riding it, and get back to my REAL project bike. Last edited by Tanshanomi; 04-08-2019 at 11:16 AM. Ah, good question. It's the extremely crude 6V generator system typical of small CB/CL/MT/XL singles. If I wanted to run an electronic speedo, I would have to rewind the stator and upgrade the regulator. Perhaps that's not such an economical idea compared to just buying a cheap mechanical speedo from Drag Specialties or someplace like that. I have the exact same bike. … or you could duct tape an iPhone to your handlebars and measure your travel speed by GPS location services as long as you stay under 80mph. about 12V conversion (from yahoo groups) It seems to be pretty much plug and play with the bigger CB stator. The coil will work with the 12 volt system. it is the same coil found on some of their other bikes that have 12v. Stator. Some model of cb350 and cb360 will work. They look nearly identical, and will have the same colored wires. Look carefully on Ebay. Make sure not to mangle the rubber oil plug that wraps around the wires, as the new on will not fit well. I used a marinating needle to get the wires from the 360 stator into the plug. Battery. I use a UB1250 battery. It's not a great fit, but it works. rectifier, the radioshack one works, and acts like a fuse, it will burn out when if there is a severe over voltage. the horn will be louder, just don't lay on it for an hour, it will burn out if used too long. Signal flasher, this is an optional change, It will flash more quickly than before, but I decided to change it to a new one anyway. Need an extra heat shield?